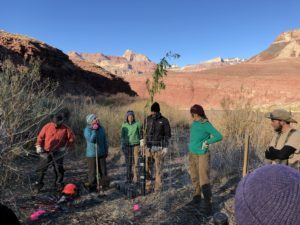 Morning Dew’s Landscape Architect David Blanchard has been working with Mariposa Ecological, Botanical Consulting and The Arboretum at Flagstaff to design the landscaping plans for habitat restoration projects along the Colorado River at the bottom of the Grand Canyon. The plans include identifying and locating invasive species for removal, techniques for removal, a planting plan and various bio-engineering techniques for planting trees in the back-country without access to irrigation. 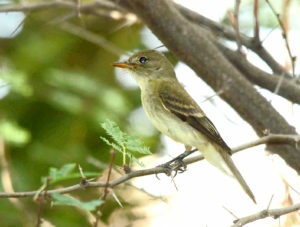 The restoration planting plan includes native trees and shrubs that are crucial for the survival of the Southern Willow Flycatcher. 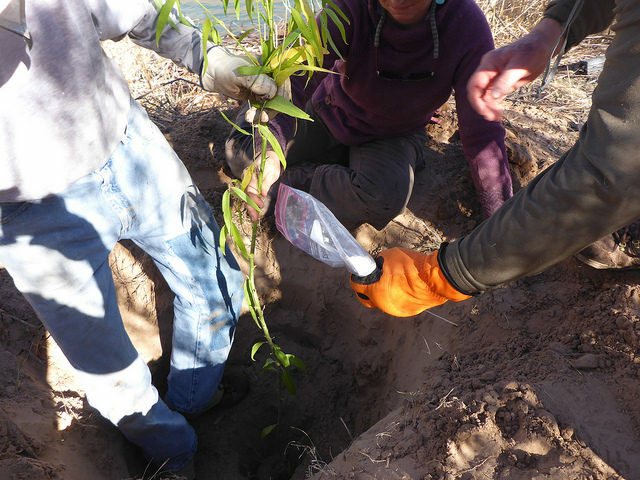 In January, this work was implemented at Cardenas Camp (River Mile 71) with help of 21 people consisting of 8 volunteers, 3 park service staff, 4 boatman, 3 employees from Morning Dew and 3 employees from the Arboretum. 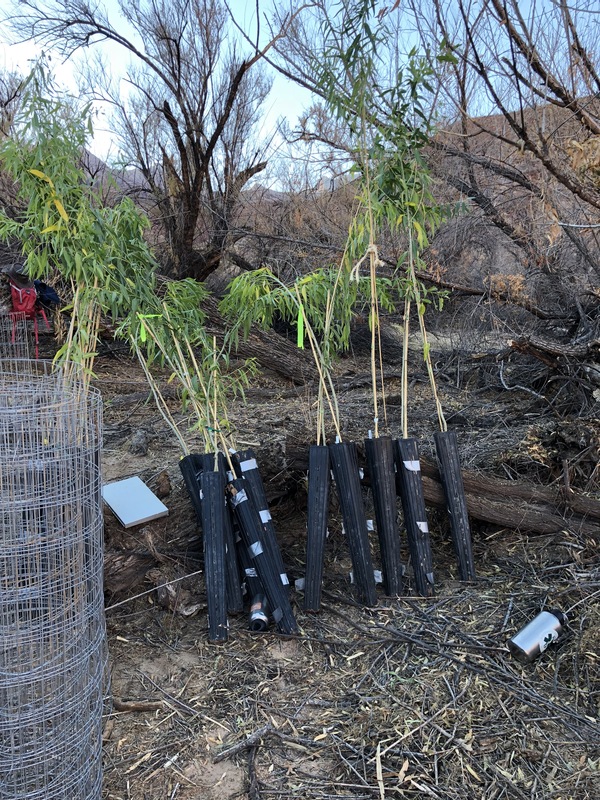 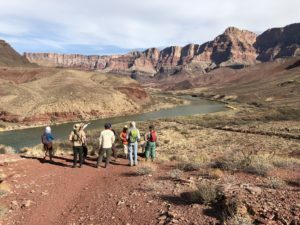 Plants, tools, and food were transported in on rafts while the volunteers, NPS and Morning Dew employees hiked in with camping gear to spend 17 days cutting tamarisk and planting cottonwoods and willows. 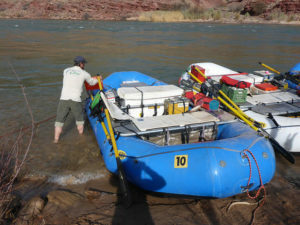 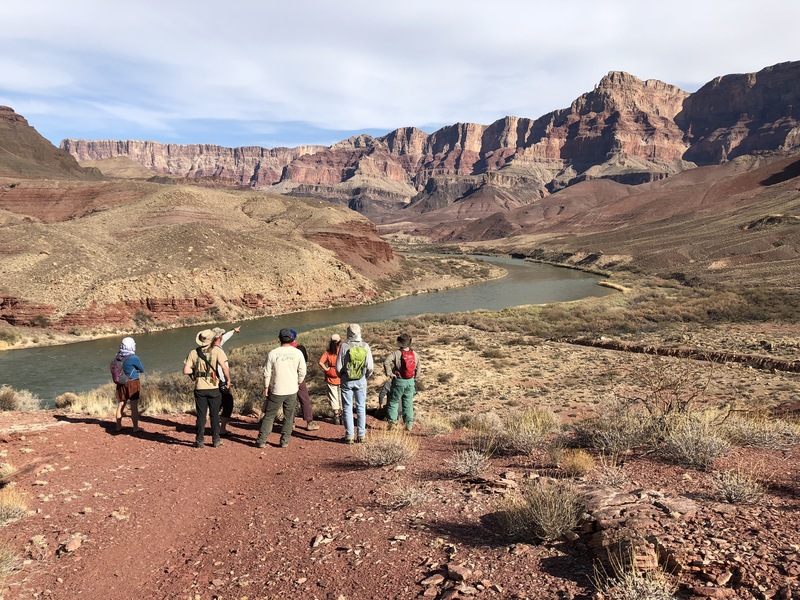 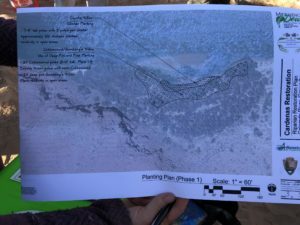 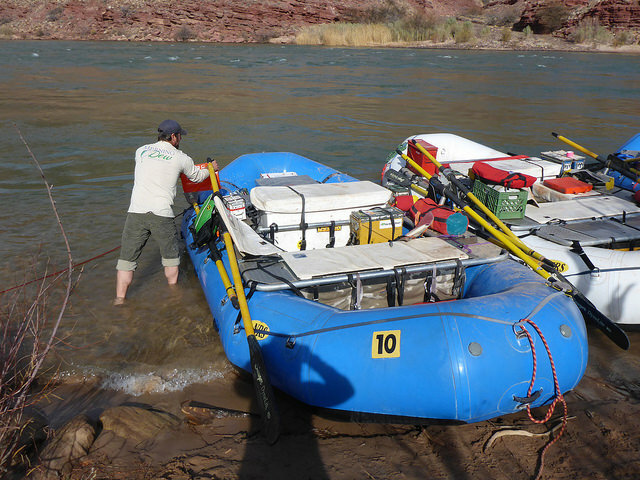 Morning Dew and Mariposa are also working with the Hualapai Tribe on a similar project at Diamond Creek, which is the take out for many of the Grand Canyon river trips. 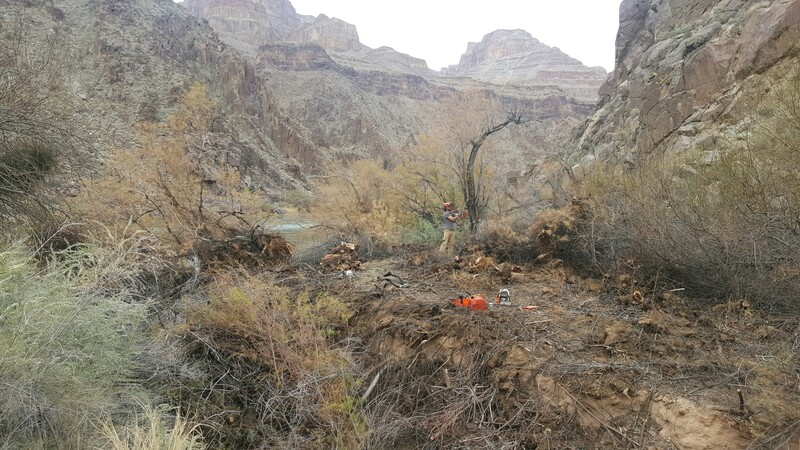 Morning Dew completed the restoration plan last year and sent a crew down with chainsaws at the end of February to remove tamarisk trees. 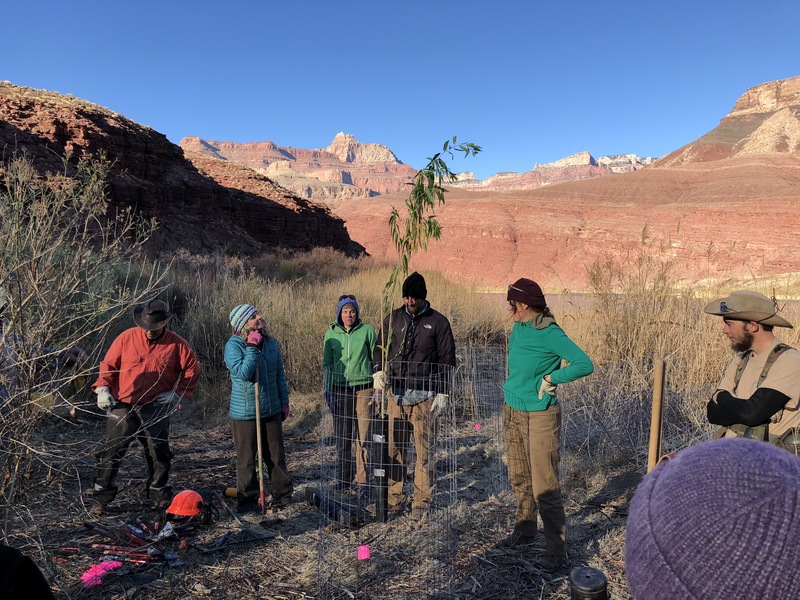 Tamarisk trees are invasive and threaten fragile riparian corridors across the southwest. Tamarisk reduces native seed germination because of the salts it concentrates on the soil surface. Tamarisk outcompete cottonwoods, willows, and mesquite, which in turn impacts wildlife habitat. 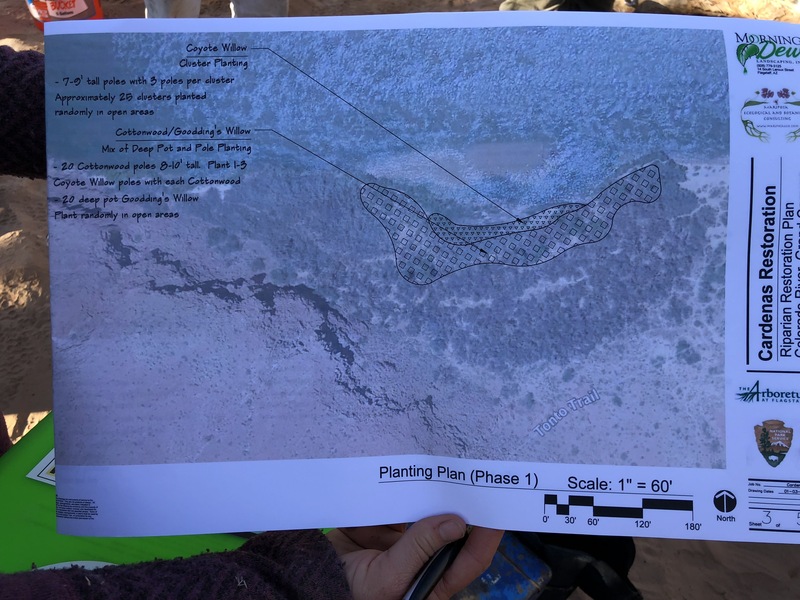 These areas will be replanted with native cottonwoods and willows in the spring of this year.